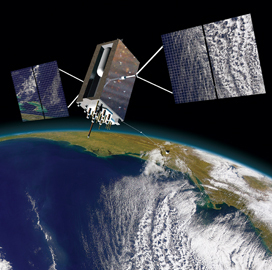 The U.S. Air Force has begun a solicitation to procure launch vehicle production, mission integration and operational services for the Global Positioning System III-3 satellite. The military service said Wednesday it will award a firm-fixed-price contract for an Evolved Expendable Launch Vehicle service after the branch evaluates interested vendors’ proposals with a “best value” source selection method. The GPS III-3 mission is scheduled to launch sometime in 2019. “Prior to contract award, the contracting officer will verify that the offeror has a certified launch system as part of a responsibility determination resulting in a high technical bar, ” said Lt. Gen. Samuel Greaves, Air Force program executive officer for space and commander of the AF Space and Missile Systems Center. Responses to the contract solicitation are due Sept. 19. The Air Force certified SpaceX‘s Falcon 9 rocket in May last year for potential use in national security satellite missions under the EELV program. Tory Bruno, CEO of United Launch Alliance, indicated during an early October media briefing that the Boeing (NYSE: BA)–Lockheed Martin (NYSE: LMT) joint venture cannot submit a bid for the GPS III launch support contract until it receives relief from the RD-180 engine ban.